A/V switches that allow for more than 4 or 5 separate connections are expensive, hard to find, and usually powered. I'm cheap, like to build my own stuff, and don't need a powered unit, so I decided to build my own. I was determined to use components in my own stock, or available at Radio Shack (only because they're close). My requirements are specialized but not exotic- I need audio inputs, and video and antenna signal outputs, for multiple devices. This switch allows for ten different 2-channel audio sources, and feeds AM and FM signals to six different tuners, TVs, or VCRs (since my receiver doesn't). And it's passive, since feeds are going in opposite directions. Digital outputs go straight to the receiver from any individual source. One disadvantage is loss of remote control. This switch is strictly old-school. One advantage is that it's flexible enough to fit a variety of input and output needs. I used all RCA jacks on the back to save space and simplify construction and use. The coax feeds have RCA adapters. The first thing was a suitable box. I used an old RCA satellite receiver case (DRD420). These units are almost free on ebay. The two pots already installed are signal attenuators for AM that have been removed from their cases. I needed two to reduce the signal from my outside antenna so it wouldn't overload my tuners. 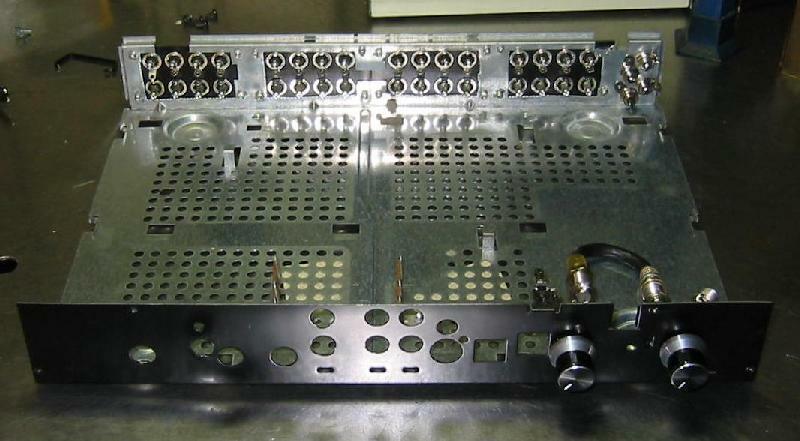 The case was cut to accomodate four banks of RCA sockets and four separate ones. The original back was made the front, and vice versa. 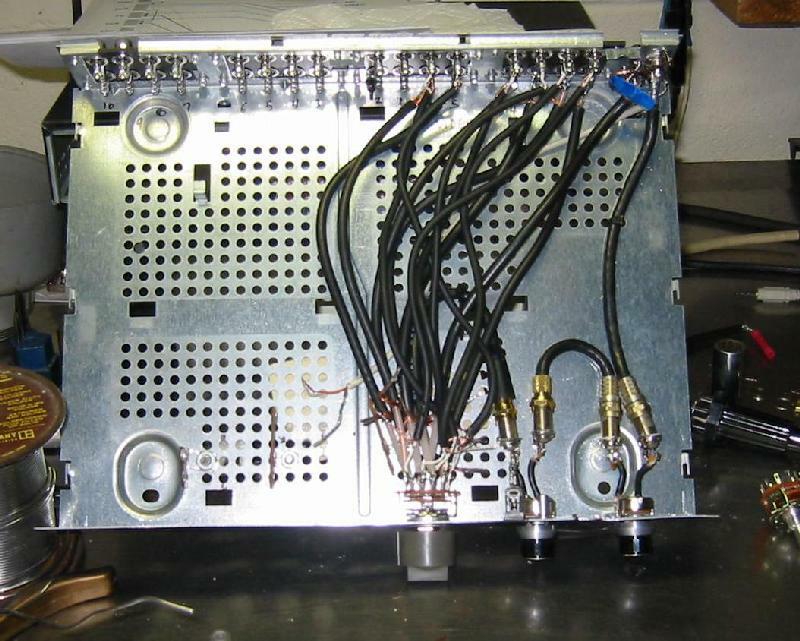 These two pictures show the video/antenna switch wired to the rear terminals, and the two AM attenuators. This picture shows the two audio selector switches connected to the rear jacks. The wire is from a 5 pin DIN audio cable and makes the wiring easier than individual RCA cables (since it carries 4 conductors plus grounds). Here's the (mostly finished) unit. The switches are 6 pole, double throw (the largest Radio Shack had). As you can tell, there are some extra visible holes, so I needed a decent-looking way to cover them. I ended up measuring things, picking switch positions, designing it in Corel Draw, and printing it out. Then I backed it manila folder stock, covered it with clear Contact plastic, and installed it. Here's the first iteration. Next template I make will be legal-size paper to cover the whole front (which was originally the back of the satellite tuner). The two left switches are for audio; the first chooses four sources, and the last position throws control to the second switch for six more. 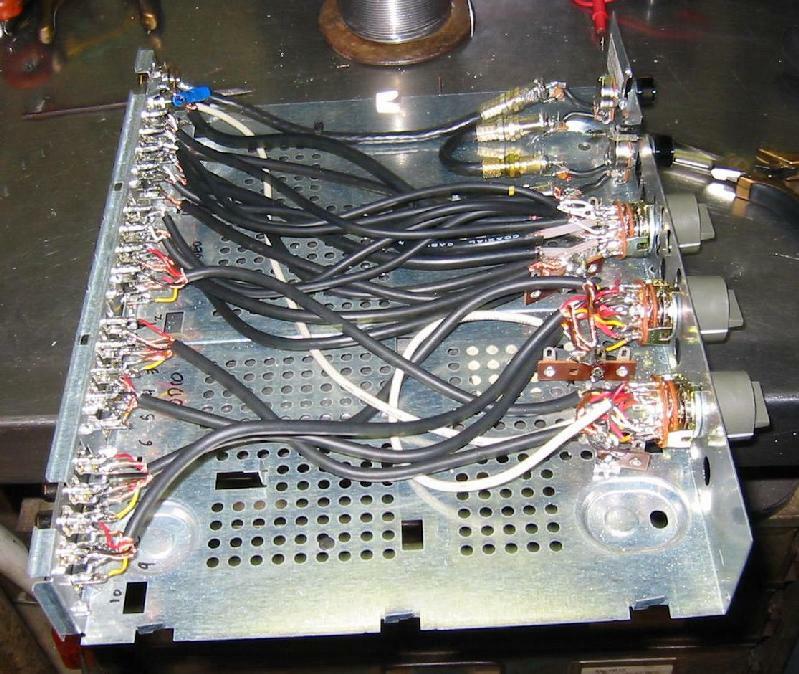 The middle switch feeds AM and FM signals from the antennas to various tuners/TV/VCR. The two right pots are connected in series to allow AM signal attenuation. It works great- audio from the sources to the receiver, and antenna signal from the antennas to the sources.